Goodbye suburbia, you’re about to grab some of that fresh air and fantastic scenery of the wide open country. You’re also about to test drive your Jeep to see how well it does away from the smooth pavement of the asphalt jungle. Oh man, no more congested traffic, no more idling at stop lights, no more viewing the same monotonous routine of monotonous building after building. You’re ready to take a real adventure. Before you start out, there is one very important factor to consider: how much clearance does your Jeep have between its under-carriage and the pavement? Jeeps traditionally sit higher off the ground than standard vehicles, such as vans and sedans, although many of the newer models do not have quite the same big boss look as those pre-1987 Willy’s, CJ’s (which are actually a military issue of the CJ’s) and Commando’s. They sit lower and often come equipped with street tires. If this is the case, the first thing you’ll want to do is get rid of those street tires. They may save you a little money on fuel consumption and give you better braking power for the stop and go frustrations of city driving, but they are a major hazard for a back-country road. If you’re driving in unpaved territory, you’re inviting a lot of sharp rocks to test out those pampered tires, and they could potentially cut your rubber to ribbons. Optimize these Jeep parts to decrease the odds of an off-road malfunction. 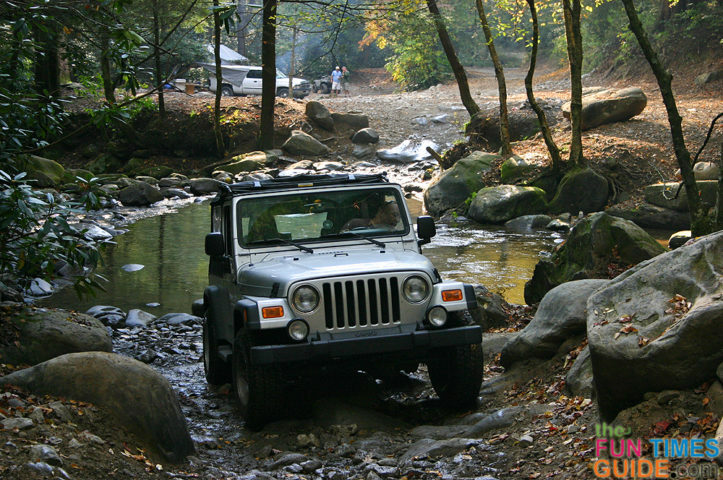 Use online retailers like Extreme Terrain to shop for aftermarket Jeep parts and a trail locator such as Trails.com for a guide to outdoor trails. Remember, just like anything else, when starting off-road driving go to the less difficult trails to learn the trade. Heavier, wider diameter tires can mean a pretty poor fit for a low-riding cruiser, but on those country roads, you have more than just a few pointy rocks to worry about. They are often filled with pot holes and sudden dips. There is no feeling more sickening than hitting a hole at fifty m.p.h, and hearing the “oomph” of your back end scraping against gravel. While you don’t want your suspension to be cranked so high you’re like a weather vane in the wind, you do want it to have enough clearance that you’re not going to bang a hole in your oil pan. Not only that, a little higher suspension means you can apply tires that look a lot bossier. One to 4 inches lift is usually enough for a back road mean machine. Get those tires first, then buy a suspension kit that will match your bad boy choice. If you have a light vehicle, you might get a little more lift than the manufacturer label says, and if the vehicle is heavy, a little less. This is all in the compression of the springs. If you find your lift wasn’t all it was cracked up to be, your vehicle is a lot heavier than you calculated. This can be the result of changing out your engine for a larger — and consequently heavier — one, adding a winch, or a large number of extra accessories. Don’t groan that all your hard labor was for nothing. You can add to your lift by bolstering it with leaf springs. The axle of your Jeep stays centered because it’s anchored into place by a track bar. When you give your Jeep a body lift, the track bar (or panhard bar, as known in some Jeep lingo circles) doesn’t automatically grow. Usually, your lift kit will come with either longer bars to keep that axle snug, and/or brackets. There are adjustable track bars you can buy that make the adjustment to your taller Jeep easier. You will not have to use relocation brackets to get the right fit, and if you decide to jack your baby down or boost her higher, all you have to do is adjust the length of your track bar. The bang – bang of a good sized boulder hitting your transfer case or oil pan can definitely shoot you down. If you want to do some serious off road driving, then protect that rock eater’s sensitive bottom. Skid plates for the rugged country side are one of the best investments you can make, no matter how well you’ve suspended your Jeep in air space. Step ups or nerf steps may not be an essential armor protection for your cross country Jeep, but they’ll certainly make it easier for you to climb into the driver’s seat. If you are worried about the aesthetics of your brute ride, there are retractable step ups that you can tuck under while you’re on the go. While you’re at it, be sure to put one on the passenger side for the little lady. She probably isn’t going to want to miss out on any of the fun, but she isn’t going to want to haul herself up like she was preparing to mount a horse. Complete your armor coated Jeep with a roll bar or roll cage. It will give you something to hang onto during that bumpy ride, and if the unspeakable happens and you do roll, it will help protect you from injury. It also adds more strength and stability to the chassis. All those modifications and you’re probably wondering by now, why don’t I just monster it? The truth is, monster trucks look good, but they are mainly just for show. Those giant wheels cost a fortune to keep feeding, and they don’t really have the agility of a Jeep that was given just a little extra clearance and an extra stout set of wheels. Take it from someone who lives in the most vicious mountains of North America. Those mountain trails don’t just go up, they also go down, and they are sometimes filled with hairpin curves. I can hear a fully loaded Mac truck going downhill a mile away by the sound of its air brakes. Imagine trying to slow down a set of rolling wheels twice as tall as the vehicle sitting on top of it. If you want a truly enjoyable back road experience, look for practicality, and your Jeep will be the true bad boy of the road.